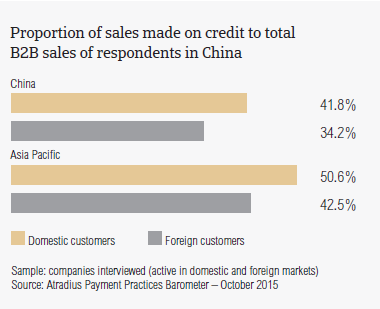 In China, domestic B2B credit-based sales average 41.8% of the total value of local sales to B2B customers. This figure is notably lower than the 50.6% average of Asia Pacific. Chinese respondents reported that credit-based sales to B2B customers abroad average 34.2% of the total value of exports. This figure is much lower than the average of Asia Pacific (42.5%). Both averages for China are the lowest of all the countries surveyed in the region. The above mentioned statistics are in line with what was already observed in past surveys. Moreover, they confirm that Chinese respondents prefer payment in cash, cash equivalents or on terms other than trade credit, particularly in transactions with their foreign B2B customers. This suggests an inconsistent perception of payment default risks arising from domestic and foreign B2B trade. However, when trade credit decisions are made, respondents in China sell on credit almost as often as respondents in Taiwan and Indonesia do. Over the past year, the average proportion of domestic B2B sales on credit in China increased slightly (by an average of 3.5 percentage points). This is consistent with the average 3.2 percentage point increase recorded in Asia Pacific over the same time frame. Similarly, the proportion of credit-based sales to B2B customers abroad increased 3.6 percentage points in 2014. This is lower than the 5.5 percentage point increase recorded at regional level. These survey findings have to be evaluated against the current economic slowdown in China. The economy is estimated to grow 7.1% in 2015 and 7.0% in 2016, respectively. This deceleration of economic growth is partially due to the measures taken by the Chinese authorities’ to transform the country’s ‘export-driven’ economy into a ‘consumption-driven’ one. Domestic B2B customers of respondents in China are given an average of 37 days from the invoice date to pay invoices. This term, which increased by an average of two weeks over the past two years, and has been steady since 2014, is four days longer than the average for Asia Pacific (33 days). It is the third longest average payment term of the countries surveyed in Asia Pacific, after those recorded in Taiwan (41 days) and Japan (47 days). 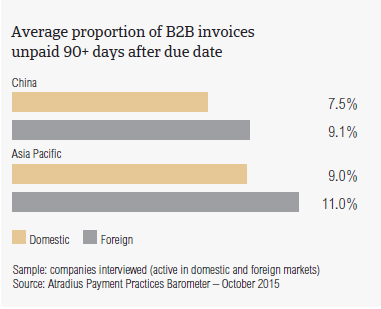 Foreign B2B customers of Chinese respondents are granted, on average, slightly more time to pay invoices. The payment term granted to customers abroad, averaging 41 days from the invoice date, is eight days longer than the average term for the region. Moreover, it is significantly longer than two years ago (by an average of two weeks) and unchanged since last year. 93.6% of respondents in China (above the 90.2% of respondents in Asia Pacific) reported having experienced invoice late payment from their B2B customers over the past year. The domestic insolvency environment in China is expected to deteriorate in the coming months, as economic growth is cooling down. Late payment from respondents’ domestic B2B customers occurred almost as often as did late payment from customers abroad. This has translated into an almost equal average proportion of domestic and foreign B2B invoices which remained outstanding after the due date. On average, 43.1% of the total value of domestic, and 42.4% of the total value of foreign B2B invoices were reported to be overdue. Both averages for China, however, are lower than the averages for Asia Pacific (44.8% domestic and 45.2% foreign). Compared with the above mentioned frequency of late payment, these findings suggest that, in China, late payment by B2B customers occurs more frequently on invoices for small amounts than in most of the other countries in Asia Pacific. Very long outstanding receivables (unpaid after 90 days or more) averaged 7.5% of the total value of domestic, and nearly 10% of the total value of foreign B2B invoices (the averages for Asia Pacific were 8.8% domestic and 11% foreign). An indication that B2B customers of Chinese respondents delay invoice payment is given by the Days Sales Outstanding (DSO) figure recorded in the country. This averages 39 days (four days above the 35 days regional average). This suggests that businesses interviewed in China, along with those in countries with a longer than average DSO for the region (Japan, Singapore and Taiwan), tend to have a higher proportion of B2B customers who often don’t settle their payments in a timely manner. These outstanding invoices are very likely to be defaulted on. This means that the potential exposure to trade credit risk of businesses in the above mentioned countries is higher than that of their peers in other Asia Pacific countries. 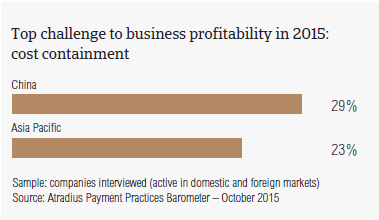 Domestic B2B customers of respondents in China settle their overdue payments, on average, 22 days after the due date. Foreign past due invoices are paid by customers, on average, not later than 25 days after the due date. Both figures are in line with the regional averages (25 days domestic and 28 days foreign). This means that B2B suppliers in China receive payment on past due domestic B2B invoices, on average, around 60 days after invoicing, and on foreign invoices after about 67 days from the invoice date. Over the past two years, b the volume and value of domestic and foreign invoices paid late registered an average 10% increase. B2B customers of Chinese respondents appeared to delay payments for a number of reasons, which will be commented on further in the ‘Key payment delay factors’ section of this report. Invoice late payment, and the cost of carrying trade debts, can have a negative impact on profitability. This may be the reason why cost containment is regarded by 28.6% of the Chinese respondents (versus an average 23.0% for Asia Pacific) to be one of the biggest challenges to business profitability this year. Markedly above the regional average is also the percentage of Chinese respondents who consider maintaining adequate cash flow the biggest challenge to profitability this year (nearly 25%, versus 19.3% for Asia Pacific). This likely reflects the overall downward trend in bank lending observed in the country. In light of that, it is understandable that efficiency in receivables management is a concern for respondents in China (14.3%) more than it is for their Asia Pacific peers (11.9%). Most of the respondents in China (62% indicated that late payment from domestic B2B customers is mainly attributable to liquidity constraints. This is markedly above the 46.3% of respondents in Asia Pacific, and the highest response rate in the region. This highlights the challenging economic conditions currently present in China as the country attempts to move from an investment-led to a consumption-led economic growth model. Compared to the 21.3% survey average, 27.3% of Chinese respondents reported that late payment of domestic B2B invoices was most often due to the formal insolvency of the buyer. For foreign payments, the most frequently mentioned reasons for payment delays are the complexity of the payment procedure (43.5% of respondents, versus 39.5% in Asia Pacific) and liquidity constraints (40.6% of respondents, versus 34.5% for the region). Disputes over the quality of goods and services provided follows as the third most frequent reason for slow payment from customers, cited by nearly 37% of respondents, versus 28.3% in the region overall. 1.8% of the average total value of B2B receivables in China was reported by respondents as uncollectable. This is below the 2.0% regional average. Consistent with the survey pattern, domestic write-offs outweigh foreign ones. This likely reflects cultural and language differences in international business relationships. Domestic and foreign uncollectable B2B receivables were primarily reported to stem from the construction, consumer durables, food and electronics sectors. For most of the respondents in China (just over 52%), B2B receivables went uncollected due to the customer being bankrupt or out of business. This compares to 54.4% of respondents in Asia Pacific. 41.5% Two in five Chinese respondents said that B2B receivables could not be collected due to the failure of the collection attempts (38.6% of respondents in Asia Pacific). A markedly higher percentage of respondents in China (37%) than in Asia Pacific (24.3%) said that B2B receivables were written off as uncollectable as the additional costs to pursue the debtors were too high. Survey respondents in China reported granting trade credit terms mainly to B2B customers belonging to the agriculture, chemicals, construction, consumer durables, electronics, food, metals, and services (financial and business services) sectors. The longest payment terms, averaging 46 days from the invoice date, are given to domestic and foreign B2B customers in the financial services sector. In spite of the lenient payment terms granted, B2B customers in the financial services sector generated the highest levels of past due payments. Around three-fifths of the total value of B2B invoices were unpaid by the due date, most often from customers abroad. Liquidity issues were the most frequently reported reason for domestic payment delays in the chemicals and electronics sectors (around 70% of respondents). Four in nine respondents said that late payment from domestic B2B customers was most often due to formal insolvency of the buyer. Invoice payment delay from foreign buyers due to the complexity of the payment procedure occurred most often in the financial services sector (42% of respondents). For around 55% of respondents, foreign customers in the electronics sector delayed payment of invoices most often due to liquidity issues and disputes over the goods and services provided. Around four in nine respondents in China said that they do not expect any change in the payment behaviour of domestic B2B customers over the coming 12 months. One in five anticipates a worsening, particularly in the construction sector. Around three in eight respondents expect an improvement in the payment behaviour of domestic customers, particularly in the electronics sector. Around 43% of respondents in China do not anticipate any significant variation in the payment behaviour of foreign B2B customers over the coming 12 months. Around one in five of respondents expect a worsening, most likely in the construction and consumer durables sectors. An improvement in foreign payment behaviour, mainly in the food and chemicals sectors, is expected by over twice as many respondents as those anticipating a worsening.